The best baked cauliflower cheese made with slices of fennel and baked in an absolutely delicious cheese sauce. It’s topped with, wait for it…more cheese and comes out of the oven bubbling, golden and smelling so delicious it’s hard to wait before getting stuck in! Baked cauliflower cheese, the ultimate comfort food side dish. 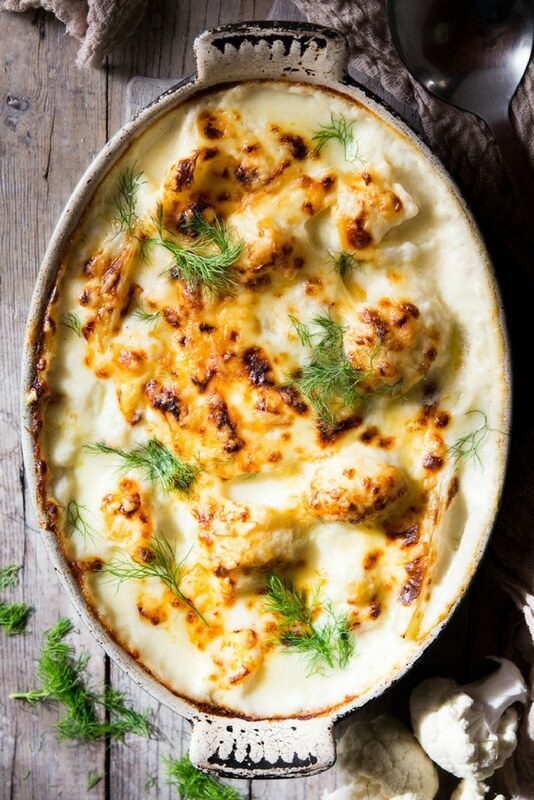 Cauliflower cheese is a side dish I grew up with as part of a Sunday roast which consisted of either roast beef or roast chicken and a whole array of veggie side dishes. My Mum would pull out all the stops (and still does) but the thing we all loved the most was the cheesy, golden, baked cauliflower cheese. It’s just pure comfort food and pretty much goes with any main course (almost) I mean, it’s even great on its own. If someone plonked a plate of baked cauliflower cheese down in front of me for dinner and nothing else well, I would not complain one bit. I added a twist to this recipe by adding fennel and believe it or not baked cauliflower and fennel gratin is a delicious side dish from the North of Italy. They love their cheese up there and maybe I’ve gone a little overboard compared to the Italians but that’s just me. What Can I Add To Baked Cauliflower Cheese? First, cut the green tops off the fennel (keep the fronds for garnish) cut it into thick slices and break the cauliflower into small florets. You’ll need to cut the stalk off the cauliflower first then it’s easy to break and cut apart (photo 1). Boil the fennel and cauliflower in a large pot of salted boiling water for 3 minutes then drain and set aside. To make the cheese sauce, add the butter to a saucepan over a medium heat, once melted add the flour and stir to a thick paste. Let it cook for 1 minute whilst stirring (this cooks out the floury taste) (photo 2). Next, add 1 cup (250ml) of milk whilst whisking to avoid any lumps (keep whisking until it thickens then add 1 more cup of milk. Whisk again until it thickens then add the final cup with a good pinch of salt, pepper and nutmeg. Once that starts to thicken add 1 cup (110g) of grated cheese and stir until it melts, turn off the heat (photos 3-6). 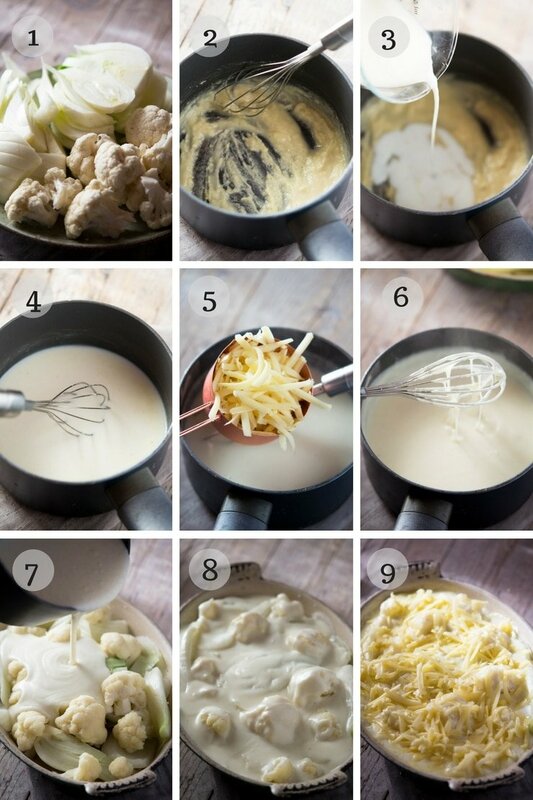 Add the fennel and cauliflower to a large baking dish and pour over the cheese sauce (photos 7 & 8). Cover the dish with tin foil and bake in the oven for 20 minutes. Remove the foil and top the baked cauliflower cheese with the remaining grated cheese. Bake uncovered for another 10-15 minutes or until the cheese is golden, melted and bubbling. Serve. 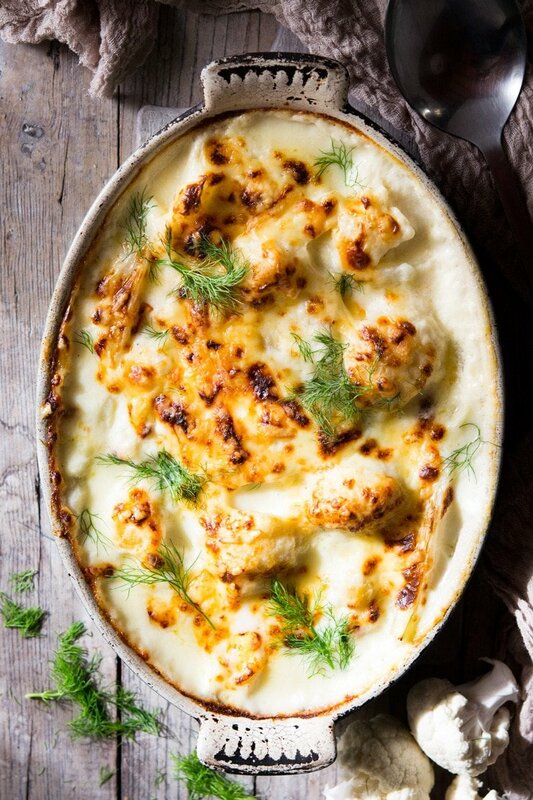 If you’ve tried this baked cauliflower cheese and fennel or any other recipe on the blog then don’t forget to rate the recipe and let me know how you got on in the comments below, I love hearing from you! You can also FOLLOW ME on FACEBOOK, TWITTER, INSTAGRAM and PINTEREST to see more delicious food and what I’m getting up to. 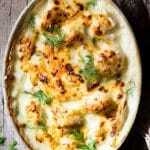 The best baked cauliflower cheese made with slices of fennel and baked in an absolutely delicious cheese sauce. It's topped with, wait for it...more cheese and comes out of the oven bubbling, golden and smelling so delicious it's hard to wait before getting stuck in! First, cut the green tops off the fennel (keep the fronds for garnish) cut it into thick slices and break the cauliflower into small florets. You'll need to cut the stalk off the cauliflower first then it's easy to break and cut apart. To make the cheese sauce, add the butter to a saucepan over a medium heat, once melted add the flour and stir to a thick paste. Let it cook for 1 minute whilst stirring (this cooks out the floury taste). Next, add 1 cup (250ml) of milk whilst whisking to avoid any lumps (keep whisking until it thickens then add 1 more cup of milk. Whisk again until it thickens then add the final cup with a good pinch of salt, pepper and nutmeg. Once that starts to thicken add 1 cup (110g) of grated cheese and stir until it melts, turn off the heat. Remove the foil and top the baked cauliflower cheese with the remaining grated cheese. Bake uncovered for another 10-15 minutes or until the cheese is golden. melted and bubbling. Garnish with fennel fronds (optional) serve. What do you think about adding some browned chicken breast pieces to the dish or leftover rotisserie chicken? I’m thinking it would be a good main dish. Increase cooking time at all? Hi Cynthia, I’ve never tried adding chicken but I think it would work great. No need to adjust the cooking temp or time if using cooked chicken. I can eat this ALLL DAYYY! all my favorite things in a bowl. Haha it’s addictive isn’t it? I would gobble this up! I love cauliflower and I love fennel. I need to try them together! Thanks so much Marlee, it’s so yummy! The cauliflower and fennel immediately captured my attention. We love the flavor of fennel and we have a cauliflower in the fridge. As I was reading about it I was distracted and the green-eyed monster popped up. I was totally captivated by your backdrop. OMG!! That rustic wood!!!! I love it. If you ever find it missing you’ll know where to start. 😉 I am definitely making your recipe — love everything about it. Mmmm! This looks so creamy…. and cheesy…. and flavorful…. and oh, yeah… there’s cauliflower in there too! Ultimate comfort food!! Haha it’s all about the cheese! Thanks Catherine. Haha I do that too..thanks so much Alia! My husband and my Dad whine if I don’t make Cauliflower and Cheese for holidays! I could totally eat it as meal and not complain as well! I’m going to try your version with fennel! YUM! I don’t blame them lol it’s so good! I hope you enjoy my version Beth, thanks so much! Cauliflower cheese takes me back to childhood, but I’ve never had it with fennel. I do love the flavor of fennel, though, and can imagine it goes really well so might have to give this a try! 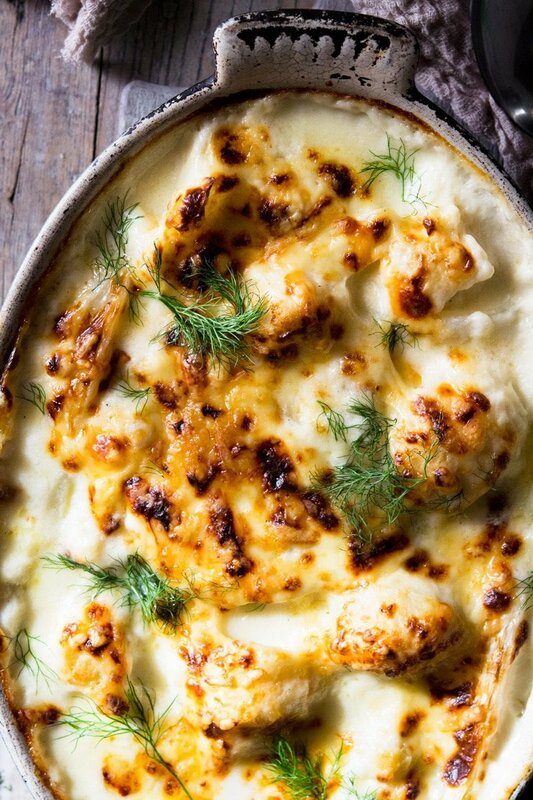 This cauliflower and fennel gratin looks scrumptious Emily, I love all the tips that you give about substitutions of veggies or cheese. I will try your wonderful recipe next Sunday, I’m sure the fam will love it! Glad you found them helpful Patty, hope you enjoy it! That’s one cheesy masterpiece! Who needs mac n cheese when you have cauliflower! I bet fennel adds a really interesting flavor contrast. I’m always looking for new ways to use fennel. I plan to start growing it in my garden this year. I love fennel this way, so yummy and that’s so great you’re planning on growing it! I am addicted to white sauce. I can eat it out of a bowl with a spoon. To feel less guilty of course I add veggies. This looks like my comfort food. LOVE how cheesy and delish this looks. Haha you and me both! Thanks so much Veena. What a gorgeous dish. I bet my kids would love it too!